First, let me say that I don't usually read police procedurals or PI novels. That said, I have to admit that I so enjoy author Sam Waas' writing style that I would gladly read his grocery lists without complaint. Mr. Waas does what few other writers these days manage to do, for me, and that is entertain. He brings his characters to life in such a manner that I could almost swear I know them in real life. I wouldn't mind tagging along on Mitch King's adventures. And though he is certainly a flawed character, his flaws make him not only vulnerable but quite appealing as well. Yes, the series is about a PI but it is so much more than just another PI story. I think this series will appeal to a wider reading audience than just hard-core private eye fans. Give BLOOD STORM a read. I think you will be pleasantly surprised. 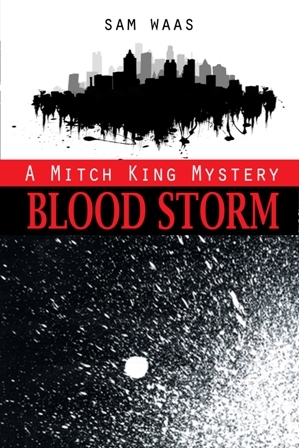 BLOOD STORM is the second book in the Mitch King private eye series. Again the author combines two different cases in an intricate yet satisfying storyline. Good characterization, dialogue that rings true, and a knack for story telling that readers and other authors will envy are in store for those who decide to read BLOOD STORM. Don't miss our interview with author Sam Waas.